I am the last one who you need to convince about the therapeutic power of dogs. I think they are wonderful comforters, counselors, and friends who know just when to offer a soft nuzzle or head on your lap. Those of you how know me or visit this blog regularly know the connection I feel to dogs and all animals. So, I loved reading an article on MSNBC’s website this week that featured the use of dogs in courtrooms as a way to calm traumatized witnesses. The story focused on a fifteen-year-old girl who was terrified to testify against the man who had been sexually abusing her for the past four years. The court allowed for a golden retriever named Rosie to sit by the girl’s side, largely unseen by jurors, to offer a head to pet when the girl would otherwise have been too afraid to speak. While this case occurred in New York, the idea of allowing dogs in court for this purpose is gaining in popularity with jurisdictions across the country employing the tactic. Rose was well-trained in easing the fears and anxieties of children, as she works at six alternative schools near New York City with children who have emotional, behavioral, and learning problems. Defense attorneys have raised the argument that these dogs can make the victims appear more sympathetic to jurors, but their objections have fallen mostly on deaf ears. In the case of Rose, the attorney noted that there is no law in New York allowing the dog to be in the court and he plans to appeal if his client is found guilty. 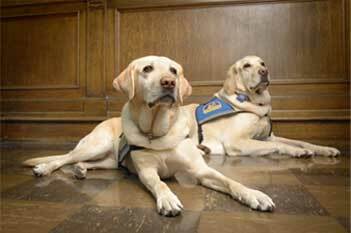 What do you think of allowing dogs in the court to comfort those taking the stand? Is this a great therapy tool or a move that creates unfair bias towards the victim? Share your thoughts! This entry was posted in K9 and tagged author jennifer chase, compulsion, courtroom, dog therapy, thrillers. Bookmark the permalink.